HD4100 Fire/Water File is rated 4.4 out of 5 by 66. 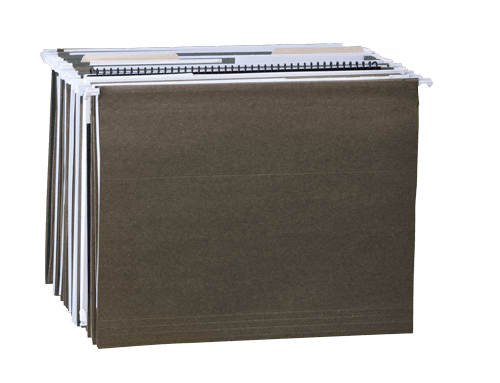 The HD4100 holds up to 40 standard hanging folders making it the ideal storage solution for your important family or business documents. In-lid organization keeps frequently accessed items such as passports, check books and digital media within easy reach. Complete with ETL Verified flood protection and UL Classified fire protection to provide true peace-of-mind for your irreplaceable valuables. 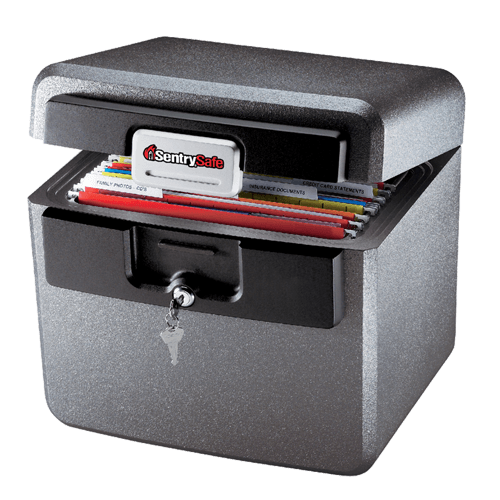 Rated 2 out of 5 by Unsatisfied Customer from You get what you pay for I wanted a small safe to keep my personal documents safe and secure. I first bought a cheaper sentry safe that I thought would work but when I got it out of the box the bottom of the safe was swollen and wouldn't sit flat. I took it back and decided to step up a price range to this safe. It seemed great until I tried to put hanging folders and file folders in it and realized this safe was also swollen and the files couldn't fit inside without bending. I had to trim 1/4" off of every folder to get them to fit. 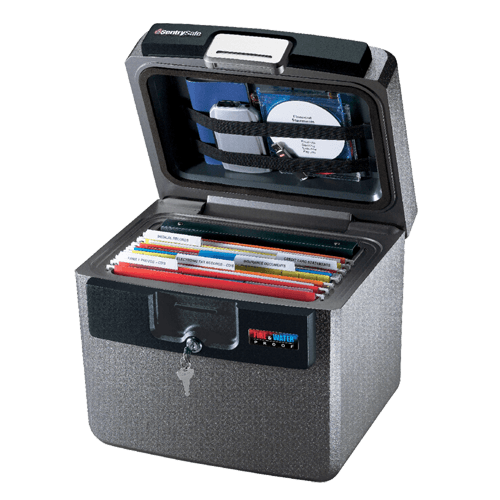 If you need a cheap safe to keep documents safe this might work but it is a cheap quality safe. If you want a nice safe keep looking. Rated 3 out of 5 by Chris9393 from Where is the handle? This page states under the "Features" that the HD4100 model has a carrying handle, but when I ordered one, it does not have the handle. That was one of the features I wanted since this safe is heavy (38.85 lbs. when empty). Very misleading. Hopefully I can return the safe, but I don't think I can order another SentrySafe with confidence since I have no guarantee that the features listed will actually be on the safe when I receive it. Rated 4 out of 5 by Mrc123 from Very solid but insanely heavy! This firebox is sturdy and very heavy duty. I bought it to store important documents. However, it was too heavy for me to even move it. I had to literally use a hand-cart to move it! There is no handle to aid in moving it. It is advertised as a firebox, but honestly it is more like a small safe. I like its other features but I don't know why they made it so dang heavy! Rated 2 out of 5 by Buckeroo from A fire proof box - not a safe These items with a lid, all sizes are not safes. They are not secure from unwanted entry. They are merely fireproof boxes. All the hinge mechanisms are held in by plastic knobs, that will depress from use and the hinge will no longer offer any security as you can lift the lid at the hinge side. Note this does not affect its fireproof feature. The same can be said for the locking mechanisms, these are merely in place to keep the lid shut, but the handles as some on amazon have said, and the lock mechanisms have detached from the unit. Once again, this does not affect its fireproof feature. If you are looking for something that is fireproof and secure, then you need to get a real safe, not one of these boxes. Rated 4 out of 5 by Robert M Durante from Needs Handles This site is extremely strong and heavy (which is good), however, it needs handles on the sides! I don’t think it would injure the integrity of the wood and fire properties of the safe. I’ll handle on the top would not be good because the lock seems to be average compared to the weight and strength of the safe. It is very difficult to move the safe without handles. I think you can probably figure out something in your subsequent models! Rated 1 out of 5 by Martmoose from This safe is not too safe. This safe is not too safe. I can quickly break in to it with a screw driver. The locking latch needs to be metel. Also, it is too heavy not to have handles on the sides or on the top. The inside is too narrow and is barrly wide enough for hanging folders. When I tried to register it I had a very hard time finding the Modle number and serial number. The lable was not installed on the front with this information. The hinge is also plastic and can easily break. I am not too happy with the engenering for this safe. Rated 4 out of 5 by Tom S from 4/5 This safe appears to be strong and secure. I did expect a little more inside space for documents; the wall of the safe are thick. I guess to withhold high temperatures for quite some time. Also one cosmetic flaw with the molding of the product was noticed but I did not feel like lugging this heavy safe back for an exchange. Rated 1 out of 5 by Artur from Seam Bursted, Powder Leaked - HD4100 While this review was prompted by a replacement for my earlier product, I shall review the earlier product here. The first of my two safes tore at its back seam near the hinge. It leaks the powder which fills its casing. I noticed leakage as soon as I opened it, thinking the powder around the shell for the lock, in front, was dust from manufacturing/storage. With careful use, i.e., gently opening, closing, lifting, and putting down my safe, the seam in the back burst, a real nuisance when one wants to keep documents and home clean. I ended up leaving my first safe behind and buying another safe of the same model. Info for damaged safe: Model: HD4100; serial number: D-00799051. I ask SentrySafe to issue me a refund since I already purchased a replacement of the same model, with which I am very happy. The replacement was free of powder upon opening and feels sturdier than my original safe. Unfortunately, I cannot find the receipt for my first safe. Thank you, SentrySafe.